Directing this 79 minute sci-fi/horror is Drew Casson. Trying to survive an invaison is: Drew Casson as Cowen Rosewell, Georgia Bradley as Philippa Martell, Tom Scarlett as Adam Martell, Sam Carter as Kipper and Kitty Speed as Janine. Well, while digging around for a new film to watch I tripped over this one. It’s a feature film debut for… 19 year old, Drew Casson. Now, I’m throwing out his age not to knock on him, but to give a nod for the achievement. A company called Wildseed Studios is calling this flick a “Microbuster”, which they use to describe “movies made on micro budgets but with blockbuster ambitions”. All told this film pulled off everything from start to finish for as little as £23,000 (around 34,000 U.S dollars). 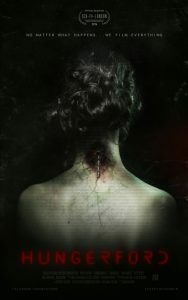 This found footage film was written by Drew Casson and Jesse Cleverly. The story isn’t anything we haven’t seen before. It’s an alien invasion with what looked like some zombie-ishness mixed into it. Zombie-ishness? Well, they’re never called a zombie, but if it shuffles like a zombie and acts all brain deadish… I’m calling it zombie influenced. Sadly, what I’m assuming was the “invasion” explosion during the movie and the movie poster are probably the two best things going on with this one. The script is just a constant excuse for everyone to run around, but never really do anything productive. I did like the twist of how to fight the aliens. It’s simple, but different, which I kind of liked seeing. The playthrough was your typical “Holy crap what are we going to do?” Everyone is running around trying to figure out what’s going on and avoiding the alien take over. 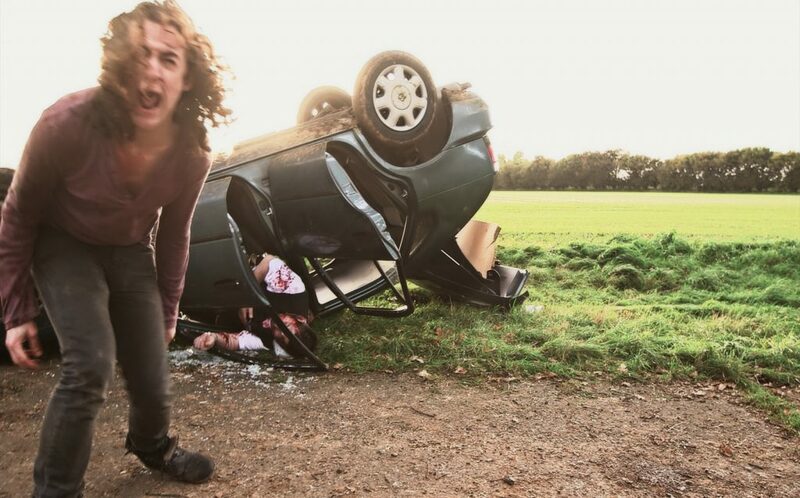 The camera work is your usual shaky camera work (as it usually is in a lot of found footage films) and close up panicked faces or being forced to focusing at the ground while everyone is running for safety. Yep, and that’s why I’m not a fan of found footage flicks. Now, the opening kept my attention because the time is spent showing the audience the relationships between the characters. With all the horse playing and jokes I was curious where all this was going. Then, everything took off… and so did my attention span. During the alien invasion everything is suppose to be fear inducing and chaos filled. Yet, I didn’t really see any of that. With the main characters outnumbered, I never felt like they were in danger. The alien masses usually attacked one at a time or if there was a lot of aliens they were so slow (old school zombie) no one was in any really danger. The special effects were pretty good for the most part. You had Frederica Vergano Bullough doing the make-up and Drew Casson doing the visual effects. The film is kind of gory but in the CGI way, gunshot to the head that disappears with an explosion of blood. Before the invasion, the cast did ok because it was just normal people sitting around joking and laughing with each other. After the invasion, the cast sold me on them being scared, but that was about it. Between aimlessly running around and a weak script, there wasn’t much for the cast to do but be scared… and film everything! Now, I understand that the screw-up character in most stories finds courage they never knew they had and becomes a leader for those that need to be lead. However, I had trouble believing Casson’s character was that person. None of the characters change or grow, they’re the same people from the beginning to the end of the film. Yet, Casson’s character (for some reason) becomes the phoenix that rises up out of the ashes of chaos and takes charge. By the end of the credits I was left with the feeling that the Earth was doomed… and not by the invasion, but by the only hero we apparently had left to lead the resistance. Apparently, Casson is working on a sequel (no title that I know of, as of yet) and is set to debut at the end of 2015. Here’s where I’m on the fence. I see a lot of potential in Casson, and I think in time he will make some great stuff. However, (even though I’ll catch it) I’m not looking forward to the sequel, at all. Summary : Is this one worth catching? Well, it's not the worse film I've sat through but after catching it, I would suggest you're better off putting your movie time elsewhere. Surprisingly, alien zombies are not as cool to watch as I thought they would be.